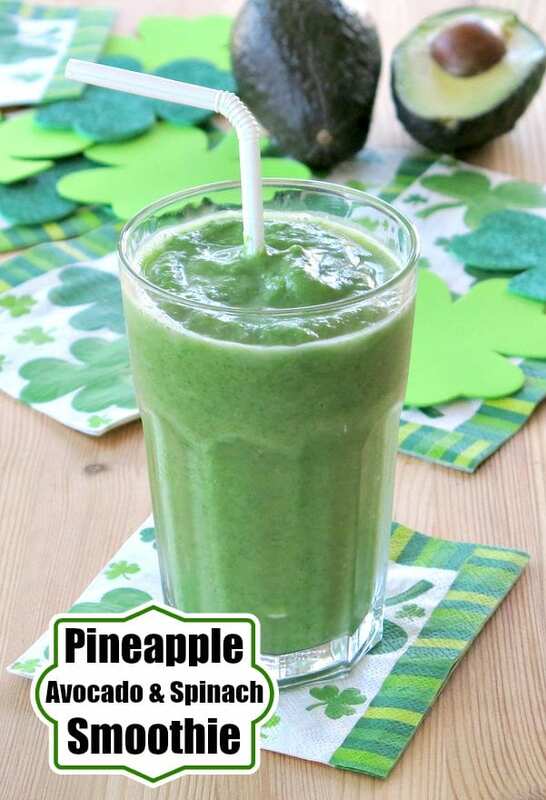 Enjoy this Pineapple Green Smoothie Recipe with avocado, spinach and a touch ginger for a healthy and delicious energy boost! This smoothie may be green, but it’s definitely not a special occasion drink. 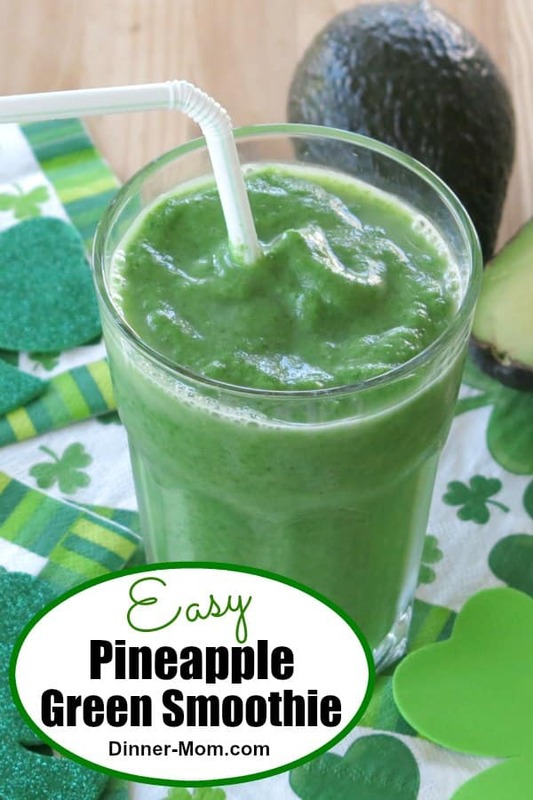 You’ll make this Pineapple Green Smoothie again and again because it’s a great way to add fruits and vegetables to your diet and it’s delicious. It’s naturally vegan too! Plus, you can take it on the road with you! If you’re busy with work or school all day and have activities at night, eating right can be hard to do. That’s the beauty of a smoothie. This creamy, frosty drink takes 5 minutes to make and you can take it with you. It’s quite the conversation starter too. We’ve got a plan to get you to green! Make a smoothie that is pretty healthy, but isn’t green. At our house, a Simple Strawberry Smoothie with yogurt was a hit. Enjoy your chosen recipe or variations of it for a short time. Revise that smoothie to be a little green by adding frozen spinach, kale or broccoli. Add in dark fruits, like blueberries or cherries to cover up the color. We used this trick in Simple Green Smoothie for Beginners, which isn’t green in color at all! But, it does have lots of spinach in it! At some point, reveal your deception. (Insert little chuckle here!) Continue this step for several weeks, preferably making more variations and adding in additional greens. 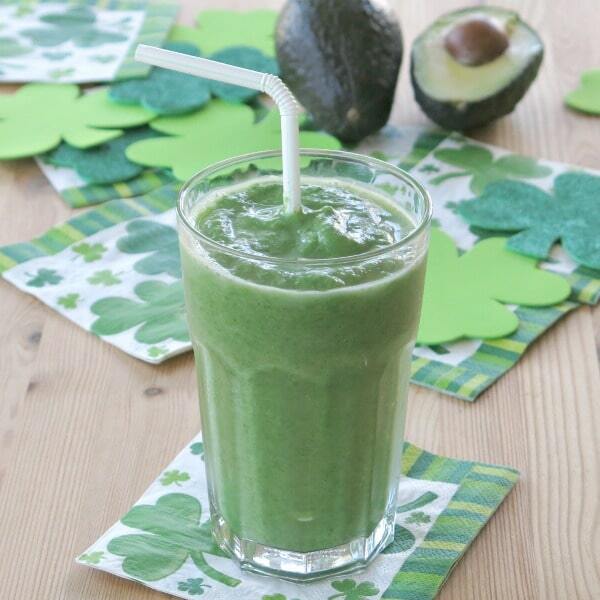 Introduce this Avocado Green Smoothie recipe. It’s bright green. There’s no getting around this fact. We first enjoyed it around St. Patrick’s Day so it way all in good fun. But, it’s delicious. The stigma was gone and we made it several times more. Once you’ve successfully moved through step 3, the sky’s the limit. Start experimenting with all the variations out there. I hope you see the humor in the timeline. 🙂 Truly, it is all about involving the resistant family members in the process, repeated exposure and making it fun! They’ll come around. Pineapple – contains bromelain and is a natural sweetener. You may find that additional sweetener is not necessary. Avocado – is high in monounsaturated oleic acid (a healthy fat.) fiber and has lots of nutrients like potassium. 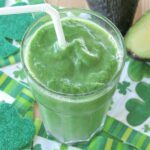 It makes this green smoothie creamy. Spinach – a power house vegetable that when used frozen spinach in this smoothie masks the taste. Ground Ginger – contains gingerol which has anti-inflammatory and antioxidant properties. It complements the flavors in this recipe. Add the ingredients to a high speed blender and follow any additional instructions for the appliance used. We used a Nutribullet and added about 1/2 cup water. If the mixture becomes too thin, add a few ice cubes to thicken it. Please rate this avocado green recipe if you make it and tag @DinnerMom or #DinnerMom on social media. We love to see what you are cooking up! 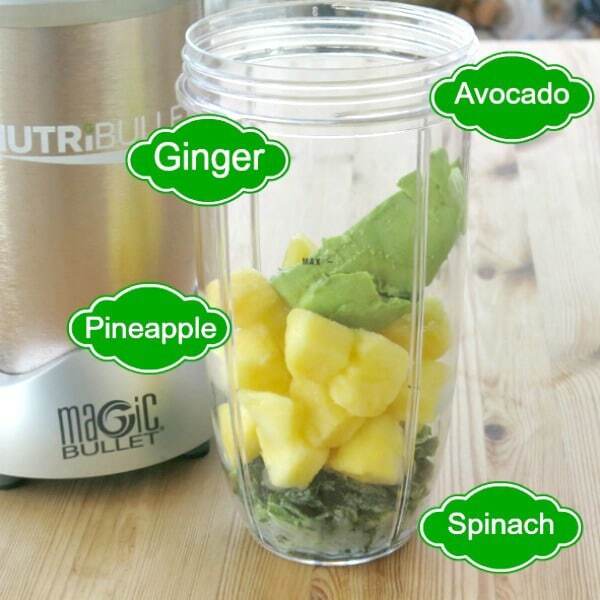 Pineapple green smoothie with avocado, spinach and touch of ginger is healthy and delicious! Add a few cubes of ice if consistency is too thin. This smoothie was very tasty. I did not need to add any sweetener because the pineapple and ginger did the trick!